A friend of VOMC, Elizabeth Kendal, wrote the following devotional for the Religious Liberty Prayer Bulletin. As she noted on her blog, "Like deep darkness, persecution, injustice and tribulation can shake a believer's faith. It can also shake the faith of faithful prayer warriors, especially if the darkness lingers. But Easter provides us all with the most perfect example of the fact that our world includes a spiritual dimension that we are not always privy to. Things are not always as they seem -- and God can be trusted. In this, Jesus Christ has shown us the way." May this reading be a blessing as we prepare our hearts to celebrate Easter and the encouragement and hope we have in Jesus Christ. On my commute home yesterday, I listened to a fascinating podcast of an interview with Barbara Demick, an award-winning journalist who recently authored the book Nothing to Envy: Ordinary Lives in North Korea. It seems to be a book that, although not specifically focused on the situation facing Christians in North Korea, would greatly enrich its reader’s understanding of the environment there, including the incredible and horrific control exercised by the totalitarian regime. The Amazon listing also notes that “One by one, we experience the moments when [these six people] realize that their government has betrayed them.” I am sure that such moments of awakening must vary from person to person, with some experiencing dramatic realizations about the falsity of their environment while others are slowly worn down by doubts and questions until the deception is finally and fully sloughed off. For me, a highlight of the interview was Demick’s story about a man whose loyalty to North Korea was shaken by mere minutes of a South Korean radio show. The content of the show? Nothing but a simple comedy routine about two women arguing over a parking space. Doesn’t sound like life altering material. And yet, it was enough to spark curiosity in this man’s heart and mind about what he had heard about the world outside North Korea's walls. Since cars are virtually nonexistent in North Korea, he was astounded to hear of a place so filled with vehicles that people actually fought for a parking space. In fact, his first reaction was to dismiss the show as some kind of ridiculous satire. However, this seemingly small exposure to the outside world eventually ate away at his faith in the alleged supremacy of the country and his loyalty to its government. He defected but a few years later. If a brief clip from a radio comedy is enough set a in motion this man’s journey into truth, just think of the effect that God’s Word can have on the long deceived and oppressed souls in North Korea. I felt reinvigorated to prayerfully intercede for my North Korean brothers and sisters. I was also reminded of those working to spread the gospel in North Korea, including VOMC partners involved in deploying gospel balloon into the country. These faithful workers are in need of fervent prayer support as well; their work can be difficult, complicated and dangerous due to obvious security concerns. In VOMC’s March newsletter, which focuses on North Korea, we included an excerpt of a testimony placed inside gospel balloons deployed by our sister mission. You can download this testimony along with several others here. They are powerful testaments to the Lord’s ability to reach even those in the most corrupt and oppressive environments with his extraordinary grace. Also, we are planning to soon share in our newsletter about our 2009 Christmas Blessing project, through which many North Korean Christians received gift packages containing such vital necessities as rice, clothing, vitamins and Bibles (the picture above is of some packages being distributed). So if you are a subscriber you can watch for that in upcoming months. It was a special opportunity for Canadian believers to reach out and show their love and support to their suffering North Korean family. Through my role with VOMC, I have learned a lot about how God can work many things, even tragedies, to His good purpose. Chief among them are powerful acts of grace and forgiveness that emerge, and seem as if they only could have emerged, following great oppression and injustice. I think, for example, of a woman I met with in Ethiopia who told me how she was raising her children to forgive the very men they watched machete their father to death. Did I come away with a new understanding of forgiveness that day? Yes. Did I marvel at the way God was equipping this woman to demonstrate the attitude of Christ in her season of affliction? Certainly. God’s goodness was alive in this woman’s life, persisting through the pain of her husband’s death. In recent weeks, while having to go through several graphic reports and photos of the mob violence in Plateau State, Nigeria, I grew weary with shock, revulsion and helplessness. Even from a distance, this chaotic whirlwind of violence, which claimed even infants as victims, had the ability to shake my composure, right down to my ability to write; I spent a lot of time staring blankly at my computer screen, searching for words to justly describe this event. Similar revulsion washed over me again this week as I read of two horrific and fatal attacks on Christians in Pakistan. In one incident a man was killed with an axe. The the other, a man was burned alive, and his wife raped. To add to the horror, the couple’s children were forced to witness the violence against their parents. How can you read such a story and not feel wretched? To be honest, while trying to sum the story up in our weekly prayer digest, I very much wished my task was to write a catalog description of a bathtub drain or some other similarly technical topic rather than an article on this gruesome story. Assurance of God’s goodness does not automatically safeguard you from such struggles. I know this, and I’m sure few would protest it. And yet, articulating these struggles can be difficult. I either feel as if I sound too defeated—like I can’t see the ultimate victory through the daily battle—or I feel false for trying to knot up my disturbed state into a tidy little conclusion. This is why it was a great comfort to me to read a blog entry written recently by Kelly Foster, a talented writer with whom I attended grad school. Kelly’s piece, entitled “Suffering and Voyeurism,” is a meditation on the toll that events of tremendous suffering can take on those who encounter them, even if at a distance via written accounts, photographs or televised reports. She tells of a time she spent studying the Holocaust in college, when she became so engrossed in the subject that she went beyond classroom research and, on her own time, vigorously immersed herself in videos on the subject. The experience so haunted her that she eventually went into a state of retreat, literally, and locked herself in her room for days. Privilege for me has not always bred deeper engagement in the world, but apathy, a contented numbness that underscores any brief encounter with the horrific—a sense that the problems are so many and so varied that I could never do enough to help anyway. When it comes to car bombs, emaciation, guerilla warfare, I am only a visitor. I am not a resident. When I turn the television off, the genocides end. Outside all I hear is the wind in the trees, not the hail of bullets. I may never become more than a visitor to the kind of practical fear in which over half the world makes its home. But of course, I can care. And of course, I can act. Kathleen Norris reminds us that to care at all is to cry out. I’m just not sure that a constant bombardment of the images of suffering, so easily turned on and off, is the optimal way to summon the kind of care that leads to action. I can most certainly relate to these feelings—not only as I attempt to cultivate this kind of active compassion in my own life and heart, but also as I attempt to effectively help summon and sustain it in others through my communications role with VOMC. It is hard enough to absorb stories of suffering as an individual, let alone have the strength to share the message in such a manner that it incites others to help. Summoning this kind of care seems impossible without entering a posture of humility and prayer—both of which require a willingness to admit when you feel despondency encroaching and threatening to overwhelm. Whether it is an reflection rendered artfully in writing, like Kelly’s, a few words said to a friend, or even a prayer whispered brokenly to God, I’ve learned that it is far more harmful to stay silent when feeling troubled than to share it with others—even if you fear that some may misread your distresses as doubt, or weakness of faith, or pessimism. I believe that to act with this kind of honesty in the face of affliction is to act with mercy. It is why I admit that some days I come to work dreading the stories of grisly violence, death and injustice that I will discover, even if I know that when considered from an eternal perspective these happenings unfold as part of God's plan and purpose. I firmly believe, also, that the mercy of this honesty is by no means solitary; it extends to those whose sufferings God has laid at your feet. After all, if we do not practice truthfulness to others about how suffering affects us at a distance, how can we expect to act rightly to those in the midst it? How can we be ready for God to usher us beyond the blank, bewildered stares and into the kind of care that leads to action? In a decision heartily welcomed by many human rights advocates, Google has decided to stop censoring its search results in China. Read the article below for more information and, as always, we welcome your comments and opinions regarding this new development. Google's decision to stop censoring its search results in China was applauded by human rights and anti-censorship activists long critical of the internet giant's decision to accede to Beijing's demands. The move threw down the gauntlet to other companies operating under strict Chinese conditions, they said. Index on Censorship, which campaigns for freedom of expression, hailed it as "a pretty brave, principled move". "Obviously, dealing with regimes like this is neither desirable for Google, nor profitable in the broader terms of dealing with censored material," said a spokesman. "It is not how the internet works." "Google have obviously looked at the long game and realised that they have to stick to their guns. And, hopefully, it will send a message to other regimes, and indeed other companies, that this kind of approach to the internet won't work. "China is a very desirable market for anybody and Google has been growing there for the past couple of years, even though it is still well behind Baidu on usage. They could very easily have taken the short-term view and said 'we'll play the regime's game'. But they have decided not to and they should be congratulated on that." Amnesty International, which has been vocal in its disappointment over Google's acquiescence to the Chinese government's demands, also welcomed the decision. "Amnesty has consistently called on companies operating in China to stop collaborating with the Chinese authorities' censorship requirements, and to respect the right to freedom of expression for web users in China," said its UK director Kate Allen. "We have repeatedly urged Google and other companies to abide by their own stated principles and provide unbiased, accurate and free access to information . "It's very welcome news that Google appears to be moving back towards these principles. This now lays down the gauntlet to other internet companies operating in China: to be transparent about what filtering and censorship the government requires them to do and to stand up for free speech where they can, using legal appeals and other judicial measures". The Committee to Protect Journalists, an independent body which protects press freedom, hoped it could see a marked change in China's attitude towards the internet. "We welcome this stand against censorship and hope that all internet companies operating in China take a similar principled position," said its deputy director Robert Mahoney. "Many of the web sites censored by the Chinese government are news and social networking websites, with a wide range of topics blocked from general discussion. Google's decision to stop censoring search results will put Google on the wrong side of the Great Firewall. "In the long run, however, we hope that it ramps up pressure on the Chinese government to allow its citizens to access the news and information they need to be informed and engaged citizens." The Washington-based Centre for Democracy and Technology, which campaigns for an open internet, said Google should be applauded for "following through on its commitment to protect human rights", and for "its continued effort to enable China's people with unfiltered access to robust sources of information, from all over the world". The group's president, Leslie Harris, added: "Whether the Chinese people will be able to take advantage of Google search now rests squarely with the Chinese government. If China allows access to unfiltered search, it will be a substantial win for global internet freedom. If China blocks access, it will make clear who is pulling the levers of censorship in the country." Consumer Watchdog, the Californian consumer, education and advocacy organisation agreed: "Google should be commended for its action. The internet giant should never have censored results in the first place, but the action is a strong move towards supporting freedom of speech on the internet," said consumer advocate John Simpson. A blogger I follow recently wrote an excellent and eloquent entry on beauty and suffering. She begins by reflecting on a poem about a trapped bird that is able to make a song of beauty out of his pained state. From there she reflects on the relationship between suffering and the “art of life,” drawing in particular from people she has known and art she has encountered. Suffering can’t be avoided, and it is indeed repulsive -- it is a result of the Fall -– but it won’t drown us if we step into it in faith and make something of it, something of beauty that touches the lives of all who experience it and reminds them that joy and triumph are realities, too, even within the suffering itself. The cage of circumstance cannot be torn away; we cannot liberate ourselves from suffering. But we can – by God’s grace – be liberated from the prison of the self when we decide to create a psalm of praise. It’s St. Patrick’s Day once again! The following is excerpted from an article written by a Benedictine monk and medieval historian in which he shares some of the background behind the historical figure, and man of faith, whose life is commemorated today. Patrick was born in the year 389 into a comfortable Christian background in Roman-occupied Britain. Like others, he took his family, his faith and his good fortune for ­granted. All this changed when a group of Irish raiders captured him and sold him and his young companions into slavery. Snatched from the comfort of his Roman villa, he found himself herding sheep and fending off wild animals on the side of an Irish mountain. Exiled, abused and exploited, Patrick turned to Christ in his desperation, and the relationship of faith that followed transformed his own life and the lives of the Irish people. Escaping from captivity, he returned to his family and became a priest. He would perhaps have settled into a comfortable clerical career had it not been for a dream in which he heard the "voice of the Irish" begging him to "come and walk once more amongst us." This he took as a summons to return and proclaim the freedom of Christ in the land of his captivity. It was a courageous decision and one that demanded all his reserves of courage and forgiveness. But Patrick's story doesn't end there. From the "Confession" we learn that his mission was anything but an easy one: He was subjected to threats and extortion, his converts were enslaved and brutalized, and his own personal integrity was called into question. For Patrick had a dark secret. Around age 15, he had committed a very serious crime. What the nature of this offense was he does not reveal, but it would have been an obstacle to his ordination had it been disclosed. He confided this to a close friend, who subsequently betrayed his trust. In consequence, Patrick's mission was called into question and the "Confession" contains an anguished defense of his ministry in the face detractors, whom he dismissively addresses as "you men of letters, sitting on your estates." You can read this article online here. Father Nguyen Van Ly (63), a Vietnamese believer who has spent more than 15 years in prison, has been temporarily released from detention on medical grounds. Father Van Ly suffered his third stroke in November 2009 and has recently been diagnosed with a brain tumour. His right leg and arm are partially paralyzed, making it difficult for him to eat or write. He was sent to a church-run home on March 15 for one year of medical treatment, after which he is expected to be returned to prison. Father Van Ly, who refuses to accept the label of criminal pinned on him by authorities, has said of his temporary release: “I’m not satisfied with what they call the temporary suspension of my sentence because if I accept the term ‘temporary suspension,' it suggests that I accept the sentence they gave me. I don’t accept even a ‘permanent suspension’ because this also means I accept the sentence." Father Van Ly has long been an outspoken opponent of the oppressive communist government in Vietnam. Since the 1970s he has campaigned for religious freedom, democracy, and freedom for the media. First ordained in 1974, Father Van Ly was sentenced to 10 years’ imprisonment in December 1983 for allegedly undermining national unity and causing public disorder. In 2001, he was sentenced to 15 years in jail for disseminating anti-government propaganda. He was released from prison in February 2005 but remained under house arrest in the Hue archbishop’s residence. He was arrested again on February 18, 2007, and sentenced to eight years in March of that year for anti-government activities after he reportedly helped organize a pro-democracy party. I came across the following report this morning from The Christian Post about an attack by gunmen on a World Vision office in Pakistan. At least five staff members are dead, one is missing, and seven have been hospitalized. It is truly heartbreaking when those who seek to be ambassadors of reconciliation in this world are targeted in such violent ways. At this time, please pray for the families of the victims as they grieve. Pray for healing for those injured. Pray that they will they keep their eyes on Jesus, persevere in their faith, and not grow weary or lose heart (Hebrews 10:32-39; Hebrews 12:1-3). Pray too for safety for other humanitarian workers in the area. A World Vision office in Pakistan was attacked by gunmen on Wednesday, leaving at least five staff members dead. The international humanitarian organization said the attack was unprovoked. Initial reports say the militants detonated grenades and opened fire on the office, which is located in the Mansehra District of Pakistan, north of the capital, Islamabad. The office received no threatening letters prior to the attack. "World Vision today is mourning the brutal and senseless deaths of five members [of] our staff," the Christian organization said in a statement. Seven additional employees have been hospitalized and one staff member is missing. "Those who kill humanitarian workers must be reminded that they are not only killing their own country's residents, but also people seeking to improve the lives of victims of poverty and injustice," the statement on Wednesday further reads. The staff consisted of local Pakistanis who were serving in relief and development work. Up to 15 gunmen arrived in pick-up vehicles and began firing on the staff, according to UK's The Times. World Vision administration officer Mohammad Sajid said the militants took their mobile phones, "dragged people one by one and shifted to an adjacent room and shot and killed them." World Vision established offices in the South Asian country, where Christians make up less than three percent of the population, in 1992 and was focused primarily on relief interventions. In 2001, the organization expanded its operations as it collaborated with other aid groups in the North West Frontier Province and Punjab Province on emergency relief assistance and community development initiatives. After a massive earthquake struck the country in October 2005, World Vision expanded further and began operating in the Mansehra District. All of World Vision's operations in the country have been suspended indefinitely. Someone was kind enough to email us recently to let us know about a discussion forum being held in Ottawa this Friday. The event -- "Freedom of Speech in China: A Global Problem?" -- is organized by The Graduate School of Public and International Affairs at the University of Ottawa and Amnesty International Canada and will explore key issues related to freedom of speech, including the targeting of human rights defenders in China who speak out, internet censorship and privacy and the role for Canada and the international community. Speakers include: Maggie Wenzhou Hou, a professor at the University of Ottawa on Human Rights in China and a Chinese human rights activist; Greg Walton from Citizen Lab, who will explore the issue of internet freedom and China; and Alex Neve, Secretary-General of Amnesty International Canada, who will provide the international context and the need for action from Canada. The event is on March 12 from 7:30-9:30 p.m. at 1160 Desmarais Building, University of Ottawa, 55 Laurier Ave East. Cases of Chinese human rights defenders Gao Zhisheng, Liu Xiaobo and Zhou Li will be profiled. You can download information here. We would love to hear from anyone who is able to attend the event. Also, feel free to contact us if you hear of similar events, as we always appreciate people bringing such opportunities to our attention. "During the last wave of anti-Christian violence, Hindu fanatics first destroyed the church in our village, then burned the houses of Christians and completely destroyed by fire whatever was inside. Then they started to look for us Christians to kill us. To save ourselves and we had to flee to the forest and the hills and remain hidden. "We stayed in hiding for 10 days…without food beneath pouring rain. There were about 20 families, we could only cry and pray to God[.] After 10 days we learned that the police had arrived. Then we came back. The police assured us that they would protect us if we returned to the village. In the houses in the village there was nothing left, not even enough rice to eat, we could not resume our normal work. So many we decided to go to Bhunaneswar or Cuttack, to find work and earn a living. But our parents stayed behind in the village. "On June 4, 2009 my father, the pastor Biswanath Digal, along with the Christian Prasanth Digal, went by motorcycle to Phulbani, about 14 kilometers from Ladapadar. Having done their work and some shopping, at 7 pm they were returning home. But some Hindu extremists had noticed them and a group of 40 or 50 was waiting for them, armed with sticks and axes. When the two Christians were in Minia, near the forest of Pidiakali, the group jumped out and stopped them. They were drunk, they insulted them and started to hit them with sticks, shouting Jai Sri Ram and Jai Bajrang Bali ki Jai! 'Kill the shepherd, so other Ladapadar Christians will become Hindus.' They were beaten unconscious. Thinking they were dead, they left them there. They remained there for 2-3 hours before a traveller saw them and informed the police of Bisipadar. "The police took them to hospital in the district of Phulbani. After two days of treatment, my father still had not regained consciousness. Since we had no money to pay, on the advice of doctors we took him to the hospital in Cuttack, on June 7. For days I took care of him, without any result. In the end the doctors said to take him home. But we had no house, because it was destroyed by Hindu fanatics. "On 19 June we brought him to a relative low in districts of Bhubaneswar. He died June 23, without ever having regained consciousness. We returned to our village and buried him there. My mother suffered a stroke from the loss. She can not walk." When I travelled to Orissa, India last fall, I heard many similar stories of heartbreak and loss. Many believers, like Lazara, had their loved ones killed and their homes destroyed in violent attacks. Some of the believers I spoke with had much difficulty in understanding or expressing the terrible things they experienced. One young woman in particular comes to mind. She was heavily pregnant when she had to flee her home during an outbreak of anti-Christian violence in 2008 (click here for more). When the time came to deliver, her baby daughter was born dead. Unable to speak about her horrific experience, her story was shared instead by her mother-in-law. I can clearly remember her vacant eyes as she listened to her story and relived the devastating loss of her baby. At the upcoming VOMC Persecuted Church Prayer Conferences this March, guest speaker Rev. Sudhakar Mondithoka -- Director of the Hyderabad Institute of Theology and Apologetics and VOMC partner -- will be sharing about the persecution occurring in Orissa and other parts of India. To find out more about the upcoming conferences, check out the conference brochure. Greg Musselman, VOMC’s Chief Communications Officer, and Fr. Marcos Marcos of the St. Mark's Coptic Orthodox Church in Toronto were recently interviewed by 100 Huntley Street about the persecution believers face in Egypt. In particular, the interview explores the recent attacks on Coptic Christians in Nag Hammadi (to find out more about these attacks, click here or here). You can watch other video reports about Egypt here. Christianity Today's liveblog recently posted an informative video about the ongoing struggles between Muslims and Christians in Jos, Nigeria. According to Christianity Today, the video examines what happens when segments of a community oppose one another in a standoff that appears to have no solution. This is a story not only of Jos, but of places throughout the world where historical differences of tribe, race, and religion lead to violent conflicts. Several arrests have been made following the burning of at least seven churches in Northern Nigeria’s Jigawa State by a mob protesting the death of a Muslim driver at the hands of traffic police. The commercial tractor driver had failed to stop in Kazaure Town when ordered to do so on 20 February, and was hospitalised after being chased and severely assaulted by a Muslim traffic policeman. The driver died from his injuries the following evening. On hearing of this death, an angry mob attacked a police station, but after being beaten back, subsequently directed their anger at local churches, destroying buildings belonging the Anglican, Apostolic, Catholic, Redeemed Christian Church of God, Word of Faith, Deeper Life and Assemblies of God denominations. Anglican Bishop Yusuf Lamu told Christian Solidarity Worldwide (CSW) that the Anglican building had recently been renovated following an earlier bout of violence and was due for re-dedication in April. He also said the churches were targeted without real cause: “They just view the Church as the enemy, not that the church has done anything”. CSW’s Chief Executive Mervyn Thomas said: “It is unfortunate that once again churches were targeted for violence following an incident that clearly had nothing to do with them. However, we commend the strong response by the Jigawa State authorities and the swift arrest of perpetrators. We urge them to ensure that justice runs its full course, that those who lost properties during this violence are swiftly compensated, and that efforts are made to ensure such incidents no longer occur”. Watch the video below and, as always, we welcome your comments. To learn more about religious conflicts in Nigeria, click here. It's hard to imagine what life is like in North Korea. The stories and testimonies that come out of this restrictive nation are incredibly tragic and difficult to even comprehend. From famine to imprisonment to public executions, it is clear that the reality in North Korea is worlds apart from our environment in Canada. With this backdrop in mind, it is amazing that North Korean Christians are able to respond to this harsh reality with love, grace, and even joy. The March edition of The Voice of the Martyrs newsletter shares some of these stories of North Korean believers who have remained firm in their faith despite the trials they face. It is our prayer that these incredible stories of how God is working to bring hope to the most hopeless of situations will inspire and challenge you. To give you an idea of reality of North Korea, watch the trailer of the movie Crossing below. This film is a featured resource you can purchase in the March newsletter, so be sure to sign up for your free copy today. You can check out other helpful resources to learn about North Korea here. Disclaimer: This film is not about a Christian family nor was it made by a Christian group. This movie is an honest portrayal of the horrors of life in North Korea. It is depressing, gritty, and contains a few situations where profanity is used. 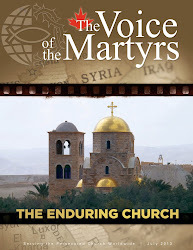 Regular viewers and readers of VOM material will notice that this does not contain the stories of courageous victory and overcoming faith that they are used to seeing. These elements are missing from this story because Christ is missing from the story. The stories of North Korean Christians contained in the March newsletter do contain the faith and courage that is typical of persecuted Christians around the world. As you can see from the trailer, the film is in Korean with English subtitles. The movie does include some profanity and while not bloody, it is very graphic and blunt. Parents are advised to review the film before allowing children of any age to watch. Jesus saves not only from sin, but also from the solitude that oppresses so many. You will enter into close communion with the saints of all ages, the angels, and more: you will walk continually in the companionship of the Lord Himself. You will also find loving brethren and sisters in the faith. Excerpted from Victorious Faith. This book by VOMC founder, Richard Wurmbrand, shares the faith that sustained him in Romania’s communist prison through stories, anecdotes and insights. You can purchase a copy today on our online catalog.